In light of Elwood's new title as Ugliest Dog, I'm fielding a request from some of you to show off Sam's mug. This pooch was the title holder for several years. Alas, just as his fame was sweeping the world, he up and expired (R.I.P.). Thankfully, as I have tried to demonstrate for 18 months now, there is no shortage of ugly in this world. If anything it grows with each passing day. 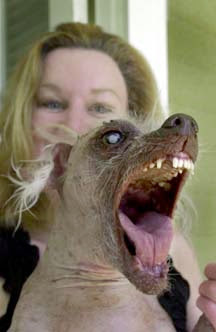 Connie sent me a link to this article on Elwood, the newly crowned winner of the ugly dog contest in Petaluma, CA. I can't get enough of this Chinese crested / chihuahua mix. 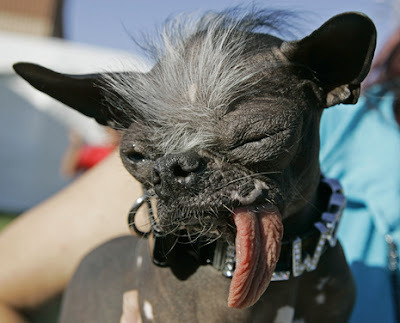 What's amazing is that the dog's breeder was going to euthanize him because he was too ugly. But Quigley, his proud owner, rescued him and has turned his once fatal flaw into fame. He even raked in a cool $1K for winning the coveted prize. Thanks for the link, Connie. And thanks for your quick action, Quigley. The world has a bit more character because of you. I could stare at this photo for hours. This is one of my favorite birds. Check out this marabou stork's hair, beak, neck, and eyes. You couldn't ask for a better shot than this. This particular bird abides in Duisburg, Germany -- far from its home in Africa. But I assume that its German keepers are doing a fine job of supplying it with carrion and other delectables. 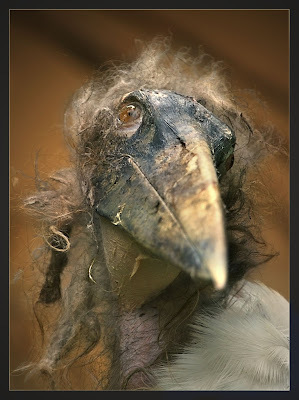 I think it's high time that the creative minds over at Disney storyboard their next animated movie around a marabou stork hero. The story can revolve around the bird's unwillingness to stick his head inside a zebra corpse. That would draw kids to the box office like flies to...well, to carrion. Thanks for letting me use your photo, Hennie. You've truly captured the beauty of this animal. I love horses. I consider myself an equinophile. 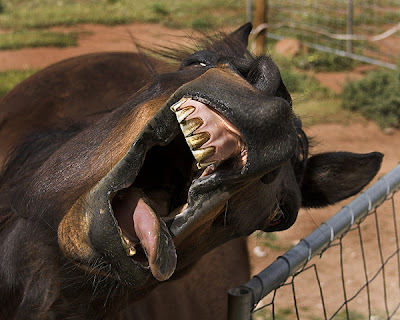 This photo has done two things for me: 1) it has further endeared horses to me, and 2) it has made me give up my dreams of becoming a dentist. Pretty much a net wash in my book. No, that's not a coaster or an ash tray. You're looking at discophus guinetti. I've done some poking around, and I can't find out much on this species. 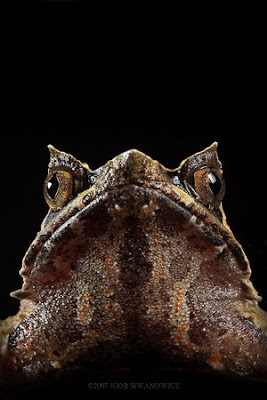 Most of the websites that discuss this frog are in French, and Google's recommending that I go with dyscophus guinetti. What do I do? All I know is that this guy looks like something I would have made for my mom in ceramics class in middle school. 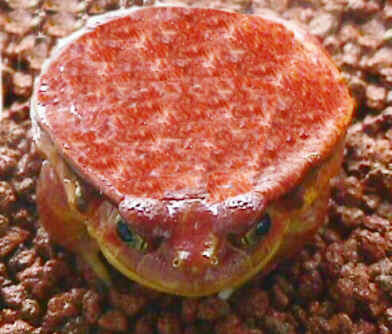 UPDATE: It looks like most of you agree that this is a tomato frog or false tomato frog. Thanks all. 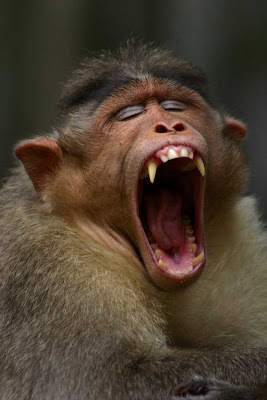 I know yawning is a contagious activity, but this doesn't trigger anything in me except my fight-or-flight instinct. 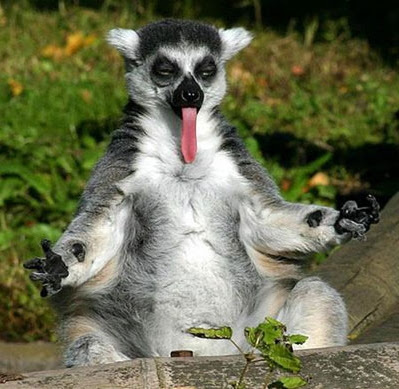 Does anyone know what kind of monkey this is? His stylish hair and fangs should be a clue. 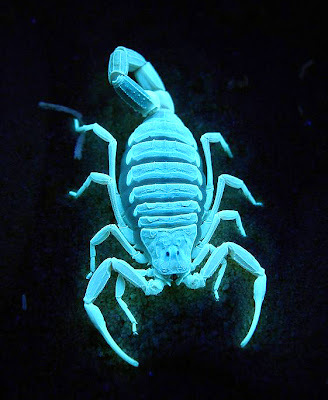 Lux recommended that I do a post on fluorescing scorpions. Being the dutiful blogger that I am, I scoured Flickr in search of some choice images. And I dug up some gems (with the gracious permission of the masterful photographer, Matt). Check out these beauties. 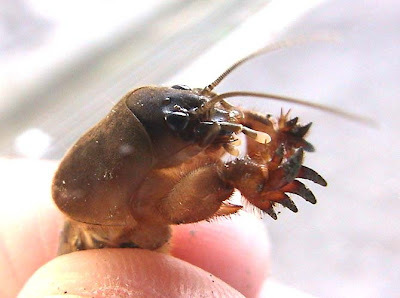 The upper scorpion is known as -- wait for it -- the Egyptian Death Stalker (leiurus quinquestriatus). It's got the most potent venom of any scorpion around. The second photo is of a pair of Arizon bark scorpions (centruroides sculpturatus). Enjoy -- and be grateful that we don't walk around in a world illuminated by only blacklights. 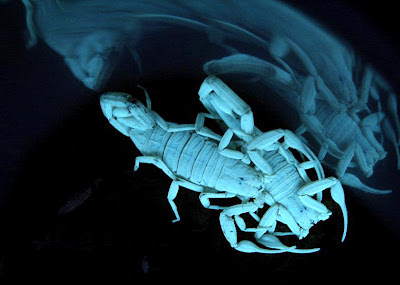 This last shot proves that even surly scorpions need a little bit of cuddlin'. 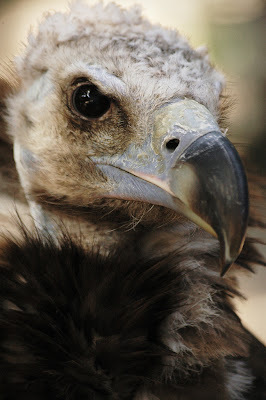 I assume this baby black vulture (that's 'buzzard' to most of us) is a bit tuffty and downy because it's a youngin'? Oh, little vulture, you have so much ahead of you. No doubt mommy brought you tasty morsels of road kill and her own vomit. But soon you'll be wafting along the hot pockets of the sky in search of your own supply bloated corpses and erstwhile critters. Fly, little carrion-eater, fly. This pinniped, strictly speaking, isn't terribly ugly, though it does have a bit of the Jabba the Seal thing going on. 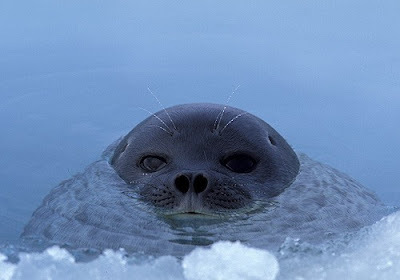 But I challenge you with this: if you didn't know it was a seal, and you were a newby to the frozen tundra, what would you think of this creature peering out at you from the blue depths, with its coal-black eyes and the hint of massive bulk lying beneath the surface of the water? I guarantee that you'd be running for your life, with your gortex pants filling up with bowel excreta. That's ugly. I've heard it asked in mysterious tones, 'have you ever seen a baby pigeon?' The implication being that maybe, just maybe they don't exist. I dismissed this out of hand. After all, I've never seen a baby eskimo, but I assume they procreate much like other humans. And, wouldn't you know it, I've been right all along. The picture below settles this debate once and for all. 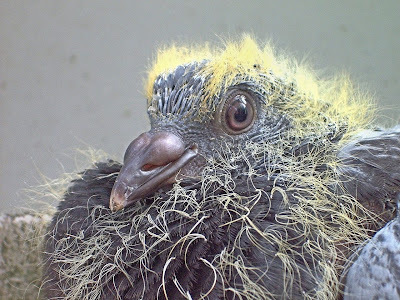 You've all now seen a baby (or juvenile, at least) pigeon, and it turns out that they are freaky. That probably explains why their parents keep them out of sight. Now this is a real jackpot. What do you get when you mix two Sphinx cats with a Chinese crested dog? 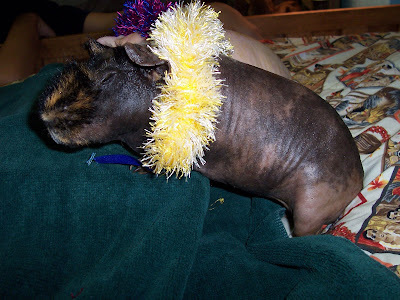 You get a writhing mass of hairless, oily, confused house pets. Even forgoing the home office decor, this scene would never be played out in nature. A horror film maybe, but not in the wild. Hmm. I'm going to write Stephen King and Anne Rice and tip them off to the next box office hit. UPDATE: CollegeGirl has corrected me. That isn't a Chinese crested. 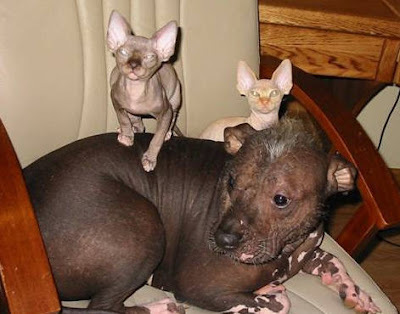 That's a Mexican Hairless, or a Xoloitzcuintli. Here's a quick follow up to my earlier post on the problems with dressing monkeys like people. 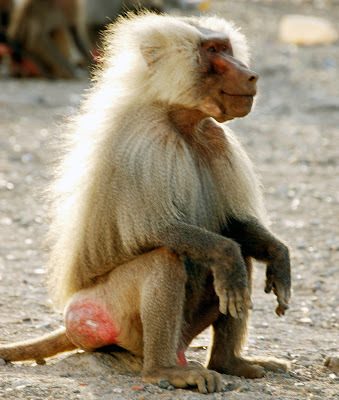 Thankfully, this monkey isn't a baboon. Still, it looks like he's deciding between taking off on his sweet ride and biting the kid's hand off. Either way, something bad is about to happen. Will we never learn? 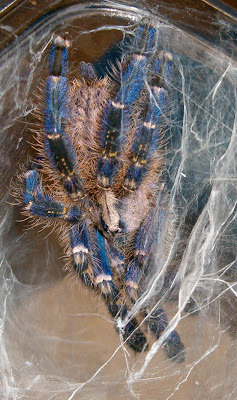 Jade sent us some new photos of his more reclusive spiders. What inspired them to come out and play, or at least to be captured on film (or diginess) we'll never know. 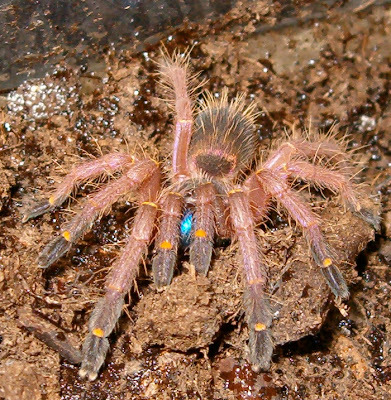 I never knew tarantulas came in these colors. Jade, if you can make them less hairy and spidery then I might be your number one customer! 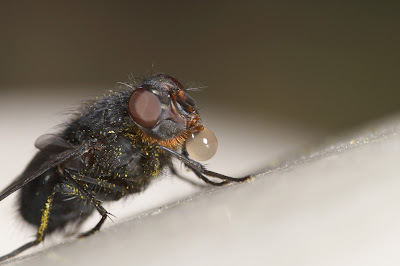 I shouldn't ask this, because I don't really want to know, but what's with flies and bubbles of goo hanging off their mouths? Is it really digestive juice that's meant to be splattered on my face? I have no doubt that he's menacing me. 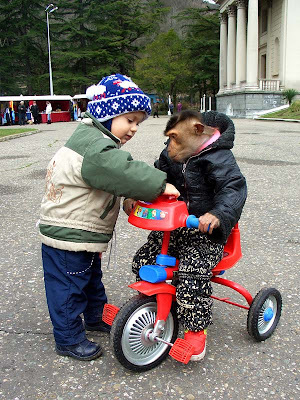 I can see dressing up a capuchin monkey, maybe even a spider monkey, and keeping it for a pet. 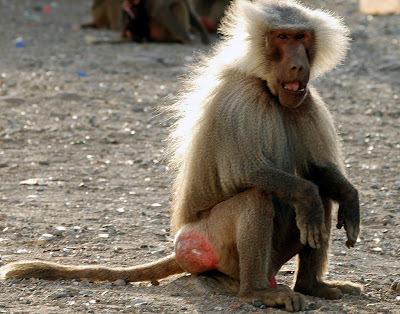 But there is something very wrong in bringing a baboon home with you! 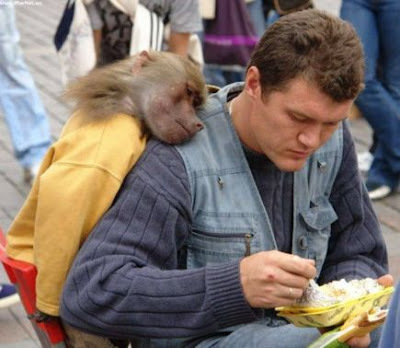 Though, admittedly, this baboon seems to have a real affection for his master. Or his master's food. Does the guy even know the monkey is there? That would spoil my appetite [[shudder]]. 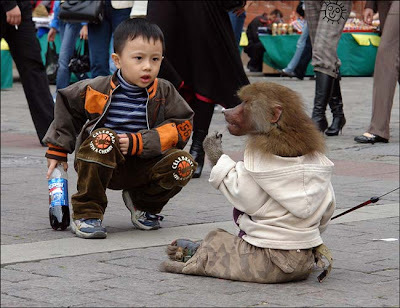 I don't think even Michael Jackson would let his kid near a streetside baboon, hooded sweatershit and leash or not. Quick, I need an ID on this so I can know what kind of Raid to buy. 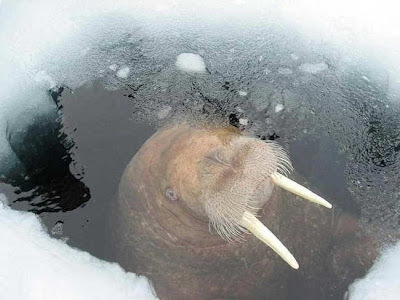 I can only guess how my nervous system would react if I walked up to an ice hole, fishing pole and bucket in hand, and saw this walrus staring back up at me. I would hope that on top of my screaming and wetting myself that I would also suffer acute short-term memory loss. 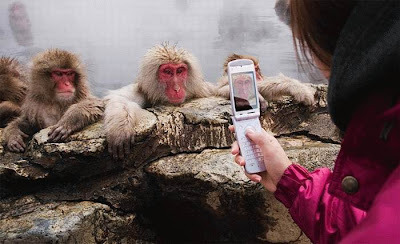 These macaques are doing it right. 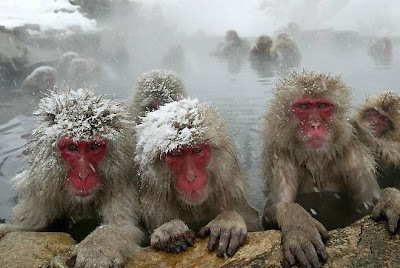 They're not only getting a reprieve from the cold, but they 've also ruined a perfectly good body of water (so like a bunch of monkeys...). I've swum in enough public pools to know to question the hygiene of some of my fellow swimmers. But monkeys? Who knows where those have been. I've seen what they eat and throw, and I don't want that leeching into my pores. 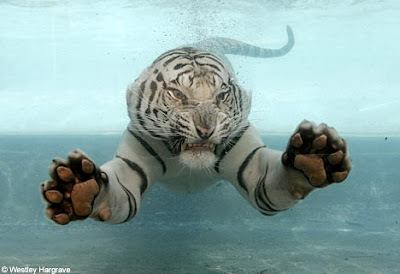 Bats (Linda) sent me a link to a Daily Mail article on this same infernal, waterborn tiger. It turns out that the diving-after-meat skill is one the cat developed on its own. 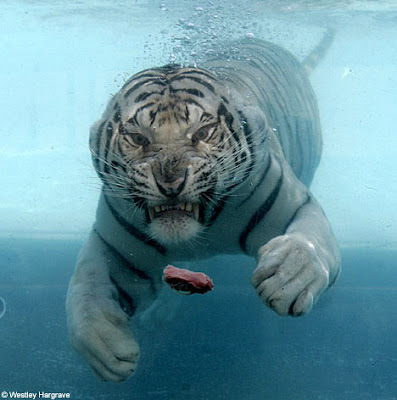 The tiger's name is Odin. Fear him. 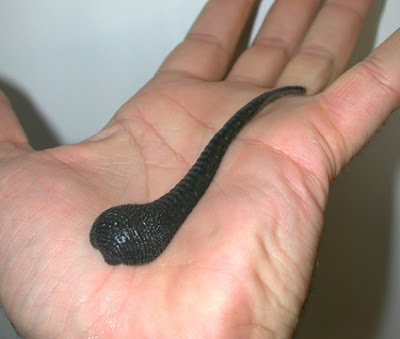 Phlimm sent me this photo of the Giant Amazon Leech. This parasite gets to be a foot long. 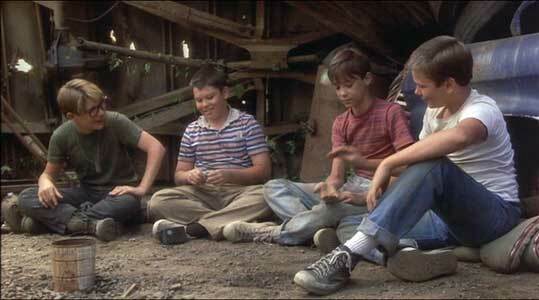 I'm just glad the movie Stand By Me wasn't filmed in the Amazon basin. 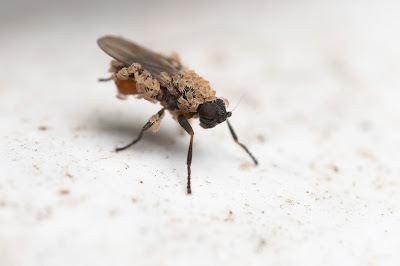 I've always thought that flies have it easy. They buzz around at their own will and pleasure, with food to be found in abundance anywhere they turn. Assuming you can steer clear of frog tongues, fly paper, and fly swatters, you're set. But then I come across these photos and realize that their lives are not so different from ours. How many times have you woken up only to find your body teeming with parasites? 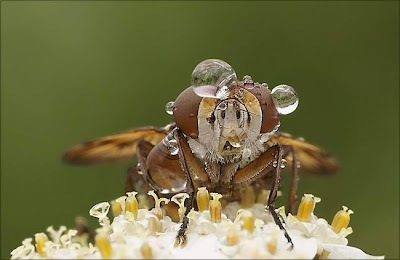 Or how often have you been captured on film with massive globules of water hanging off your compound eyes. Its amazing how much we have in common with our insectoid friends. 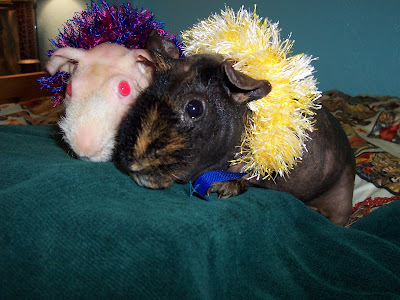 Our favorite pair of hairless guinea pigs * * Harry and Fuzzy * * are back! Sharla and Steven have captured the Aloha spirit of the islands by dressing them up in festive leis. Grass skirts might be in order for the next tour of Hawaii - such nakedness! Thanks for the photos, Sharla and Steven. 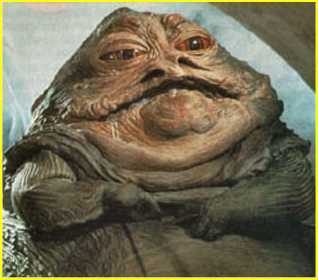 Jabba the Frog. I've never seen an amphibian strike such a dominant, triumphant pose. Igor sure knows how to work with his subjects. I don't know how he inspires them, but I love the results. Thanks for the photo, Igor. 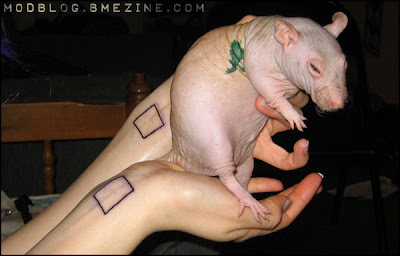 Did someone really tattoo this rat? Really? What an indignity. But then, we do dock tails, clip ears, and castrate/spay animals, so this rat may have gotten off easy. Next time, rat. Next time. 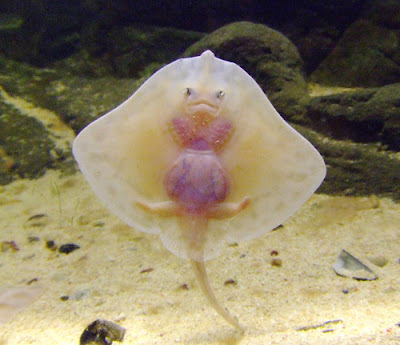 Anyone know what kind of ray this is? Why does it look like it has legs? Why is it looking at me? Thanks for the photo, Pkelias! UPDATE: Bats has identified this beastie as a clearnose skate. Thank you bats! As Jack pointed out to me, Cicadas have been in the news quite a bit lately because they are now emerging in countless numbers after seventeen years of underground living. I don't particularly care for them due to their size, but I know many of you do. 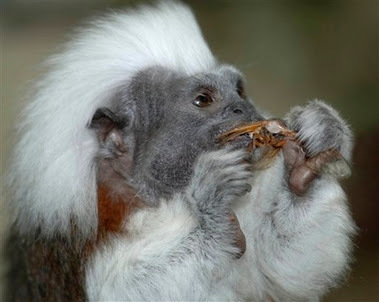 So, for all you cicada-lovers, here is a picture of one being eaten by my new favorite monkey. Monkeys really do serve a purpose. Bonnie-Ann's parents found this caterpillar in their parrots' aviary. The birds were far from happy at its presence. 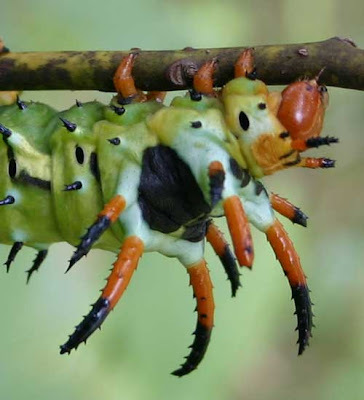 Little did they know at the time that they were dealing with a hickory horned devil! These larvae grow to be 5" long, and can take anywhere from 11 to 23 months to pupate! But those spines are harmless, much like the ones I have strapped to my back to ward off solicitors. Thanks for the link, Bonnie-Ann Black. Remember what I said a few days ago about fish being so aptly named? Here is some more proof. 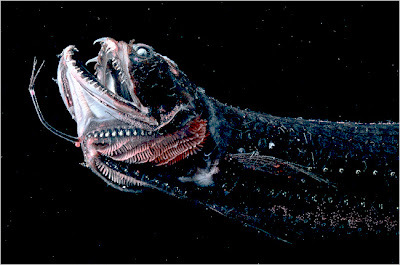 Both Dave and J. Carr sent me this New York Times link on deep sea fish. Guess what the first one is called? 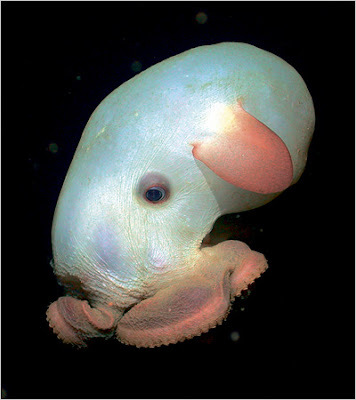 Yup, Dumbo Octopus (but his face reminds me a Star Wars Character. How about the second fish? Yup, Fan Fin Seadevil. Thanks you two. The ocean just got a bit uglier.